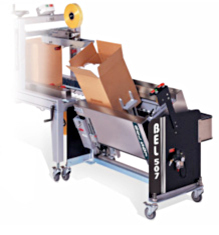 The BEL 450 is a semi-automatic poly bag inserter / case former & pack station with top & bottom case taping. Designed for use on bulk filling lines, the BEL 450 bag inserter / case former provides a cost effective alternative to the difficult process of manually inserting poly bag liners into corrugated cases. Cases are placed on the vacuum plenum after which a poly bag liner is placed into the box. The bag is quickly drawn fully into the case leaving no voids inthe boxcorners, and the case is then ready to be filled. Filling of cases can be done manually or automated further with the inclusion of an optional programmable weigh scale that can also verify count. Alternatively the BEL 450 semi-automatic poly bag inserter / case former can be fitted with an optional load cell for interfacing with existing automatic scale filling equipment such as auger or hopper fillers, and belt feeders. After filling, the operator closes the poly liner, folds the top case flaps closed and moves the case forward into the conveyor where tape is automatically applied to seal the top and bottom flaps. The BEL 450 semi-automatic poly bag inserter / case former is an ideal solution for automating bulk packing lines and can quickly recover its modest investment through labor savings and improved efficiencies. The BEL 505G3 is a multi-station, semi-automatic case former / case erector and pack station. The new generation BEL 505G3 case erecting machine embodies all the well-known ergonomic innovations of its predecessor, the BEL 505 Semi-Automatic Case Former, but is now a case forming pack station with multiple packing positions. The BEL 505G3 multi-station case erector further enables the operator to stay on top of packing by providing flexibility to pack from the rear end of the case as well as both sides. The BEL 505G3 box erector also has an expandedstandard casewidth range and is easier and quicker to adjust. Inserting a case blank into a BEL 505 case former results in automatic folding of all four bottom flaps and the case held ready for packing. Optimizing floor space in lines where space and operator orientation may be restricted, the BEL 505G3 multi-station semi-automatic case former is ideal for packagers looking to further improve ergonomics and case packing efficiency on manual case forming operations. 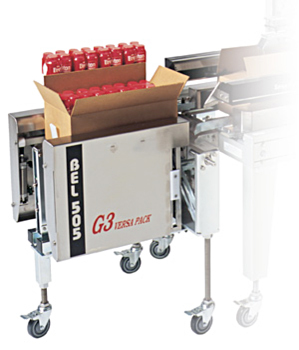 The BEL 505G4 is an extremely compact, semi-automaticcase packing systemthat integrates with a variety of case sealers, enabling one person to form, pack and seal corrugated cases in a single operation. The BEL 505G4 allows the operator to stay on top of packing by providing the flexibility to pack fromone ofthree sides of the case. This optimizes floor space in lines where space and operator orientation may be restricted. This former is ideal for packagers looking to further improve ergonomics and increase productivity. The BEL 505G4 features non-contact sensors that allow it to handle re-shipper cases and cases with a high percentage of recycled fibre or light corrugated material with greater reliability. It also features a color-coded pictorial guide, which facilitates setup and quick change- over in seconds. Bi-lingual instructions are available. The BEL 5077 507XL is a semi-automatic tilting case former / case erector and pack station. It is designed specifically for applications on manual case packing lines. By tilting the case towards the operator better ergonomics are achieved. 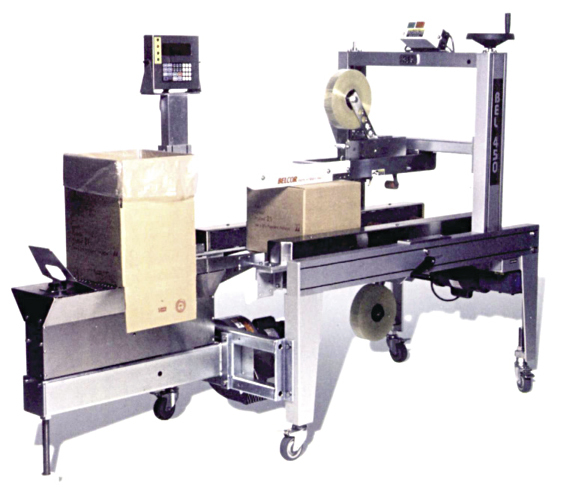 The BEL 507 semi-automatic tilting case erector is ideal for awkward packing situations such as tall cases that are easier to pack by tilting the boxtowards the operator, unstable objects subject to tipping which are easier to load with the case in a tilted position and bagged products such as snack foods which must be packed in a vertical position to prevent product damage. 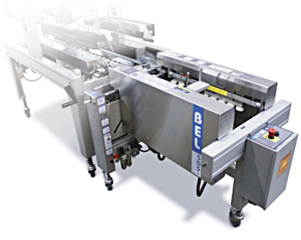 When directly connected to any BEL case sealer, the erector enables one person to form, pack and seal corrugated cases in a single operation. Installing the BEL 507 semi-automatic case formerin manual case packinglines improves productivity and eliminates extra labor needed to setup and close case bottom flaps prior to loading. Safety is improved by eliminating costly repetitive strain injury problems. Wexxar/Bel offers unlimited off-the-shelf packaging solutions and total flexibility through our completely interchangeable, mix and match modular semi-automatic case formers and case sealers.